Sadly, only a small number of movie theaters are still equipped for photochemical film projection, while H.264 or Apple ProRes-type codecs can also pose difficulties. Since this kind of situation is on the rise due to the standardization of the format, we risk no longer being able to satisfy every demand to show your films. 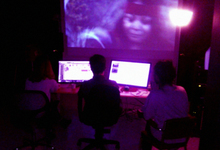 DCP files - stored ensembles of digital files (image, sound, subtitles, metadata...) - are sent via a server transfer or on a USB stick / external hard drive and played back in the projection booth on a DCP player connected to a digital projector. The technical quality of this format today is rather impressive. When it comes to digital projection, DCP is at the same level as a 35mm photochemical print would be in traditional cinema projection. It allows to project films at a resolution of 2K (2048x1080 pixels) or 4K (4096x2160 pixels), as well as in 3D. One particular advantage of the DCP standard is the possibility to have various projection speeds: in addition to 24 and 48 frames per second, speeds of 25, 30, 50 or 60 frames per second are also available. Meanwhile, it is still necessary to prepare before each screening, verifying the synchronization and color balance of the films, as different projection setups can produce different results. As part of the Atelier 105 filmmaker residency program, we have equipped our facilities for the creation of DCPs: each of the residents' films is finished in this format to ensure high projection quality. We can now extend this capability to our member-filmmakers: exclusively for their own films and at highly advantageous rates. This operation can be carried out starting from a variety of either analogue or digital sources. However, we are not equipped for the creation of video transfers. For this part of the process, we can guide you toward commercial suppliers. In addition, this format allows the optimization of subtitles. We are also able to integrate subtitles into your films. Filmmakers may take advantage of this offer by debiting the cost from the royalties on their accounts or via advance payment, the amount of which will be determined with respect to their specific needs (format of origin, length, materials, etc.). If you are interested, please email us for a form to fill out specifying your needs, so that we can provide you with an estimate.